Located in the heart of Grosseto, this spa hotel is 0.6 mi (1 km) from Grosseto Cathedral and within 12 mi (20 km) of Port of Marina di Grosseto and Natural Park of Maremma. Torre di Collelungo and Marina di Alberese are also within 16 mi (25 km). Grosseto Station is 15 minutes by foot. Located in the heart of Grosseto, this hotel is within a 15-minute walk of Piazza della Vasca, Piazza del Popolo, and Bastione Rimembranza. Monumento al Milite Ignoto and Church of San Pietro are also within 15 minutes. Grosseto Station is only a 1-minute walk. Situated on the waterfront, this spa hotel is within a 15-minute walk of Port of Marina di Grosseto and Forte di San Rocco. Natural Reserve Diaccia Botrona and Red House of Ximenes are also within 9 mi (15 km). How Much is a Hotel Room in Grosseto? 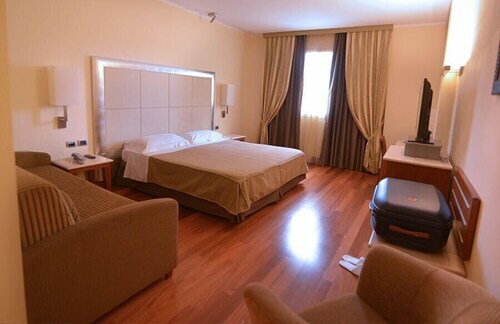 Hotels in Grosseto start at $67 per night. Prices and availability subject to change. Additional terms may apply. With some 12 places to base yourself in Grosseto, people traveling here are able to find the best option. At present, Travelocity's user-friendly booking portal boasts 12 great hotels and rooms within a short drive of Grosseto's center. Inspired travelers who have learnt about the importance of staying close to the action should check out the Hotel Nuova Grosseto and Albergo Sanlorenzo, which are situated within a 0.6-mile (1-kilometer) radius of Grosseto's heart. If you are researching places to stay that are walking distance from the Colonna Romana, the Grand Hotel Bastiani and Razza del Casalone are convenient choices. 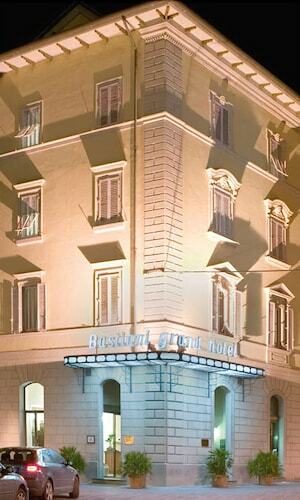 Places to stay within convenient strolling distance of the Cathedral of Grosseto are the Hotel I Crespi and Granduca. The Montebelli Agriturismo & Country Hotel is around 13 miles (20 kilometers) away from the city center of Grosseto. An alternative place to stay is the Vedetta Townhouse, which is situated 17 miles (27 kilometers) away. Other possible Travelocity-registered hotels include the Borgo San Giuliano and the Hotel Vatluna. Looking for more things to do? Spend the day checking out Giannella Beach, Feniglia Beach and Natural Dune Reserve Feniglia, which you'll find in Orbetello, 19 miles (30 kilometers) south of Grosseto. Some of our recommended Orbetello accommodations include the Podere del Priorato and Locanda Le Mandriane. 20 miles (36 kilometers) south of Grosseto, you can find [name of second nearby city or town (sibling)], home to the Italy Rents Argentario and Hotel Vittoria. The Argentario Golf Club, Cala Piccola Beach and La Soda Beach are some of the most popular points of interest to discover while in [name of second nearby city or town (sibling)]. With a population of 9,000 residents, Massa Marittima features most of the shopping and visitor facilities you'd hope to see in a regional center. While you're there think about checking out a few attractions, such as the Cathedral of Massa Marittima and Torre del Candeliere. Visitors will find some good places to sleep in Massa Marittima, including the La Siègià Resort and Pian Dei Mucini Resort Il Borgo. You'll discover Massa Marittima 25 miles (37 kilometers) to the northwest of Grosseto. Peretola Airport is the major airport for arriving by air to Grosseto. It is located 70 miles (116 kilometers) from the heart of the city. For modern travelers who would prefer to find a Travelocity-listed base nearby, book a room at Hilton Florence Metropole Hotel or Hotel Astor.